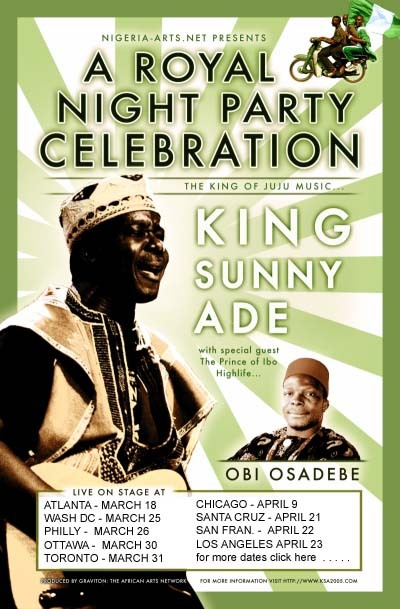 -- This could be the Sunny Ade's first hit in Nigeria. Chronological order of this one and the next one is not clear. Perhaps these two tracks are on the two sides of the same single AS21. -- This is most likely KSA's first record. According to KSA himself (via A. Kolawole), it was recorded at NBC Studio, now Radio Nigeria, at Obalende in Nov/Dec 69 and released in Jan 70, but most likely he just forgot the precise year of the release because he released a single 'Challenge Cup '67' later. -- This is a series of his four compilation albums in 1966-1971. -- This is a series of his four compilation albums in 1966-1971. The photo of the jacket appears by courtesy of Damian. -Year of the release was tracked down by Jimi Kolawole. --Reissued as a cassette 'Ekilo Fomo Ode' (Master Disc MDCl 002) in Nigeria. -- Tracks taken from his European tour in summer, 1983. Although it is a bootleg, this CD catches Sunny Ade at his peak in the western world. - Compiled from Atom Park ASLPS1-3. -- Released as a cassette 'E Dide / Get Up' (Master Disc, no suffix) in Nigeria. -- A compilation of the previously released tracks from African Songs Records. -- A reissue of earlier material with the Green Spots band. -- This is a long-awaited brand-new studio recording by Sunny Ade. Recorded and mixed at Blue Jay Recording, Carlisle MA, USA. -- Recorded live in Lagos. 'Juju-Apala features Haruna Ishola. -- His 123rd album released only in Nigeria. -- Contains live performance and interviews etc. -- 'Ja Funmi' is not indicated on the sleeve. Special thanks to Andrew C. Frankel (http://www.nwlink.com/~graviton/gravintro.html), John Beadle, Naotaka Doi, Kazuya Ogiwara, Cole Clark, Damian, and Jimi Kolawole. 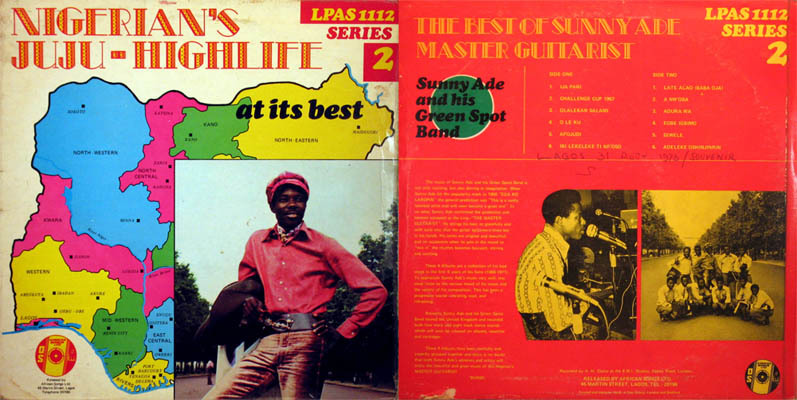 Andy provided some data on US recordings and detialed information on early singles, EPs and 'series', which was originally published in 'History of Juju Music in Nigeria' by Paul Wale Ademowo. Updated on August 7, 2018.